The Annual Game Day Mystery Make-Along with Marly Bird is back! Time to gear up for Sunday’s Big Game in our own way. Join knitters and crocheters from around the world as we work on a Mystery Make-Along project together throughout the day! Last year we had an AWESOME time doing a special make-along with you. We learned quite a few things during the process of the event and we are using what we learned to make this year better. No matter what team you are rooting for, or if you aren’t rooting for any team at all, let’s have a great time and make some beautiful pieces! When is the Game Day Make-Along? The game day make-along will take place on Sunday February 3, 2019. The first “play” will be released at 10am EST and the last “play” will be released at 5pm EST. Each hour there will be a new “play” released. All “plays” will be posted on their own page and that page will be linked here below. Be sure to come back every hour to see the new clue. How do I participate in the Game Day Make-Along? Go to the Marly Bird Facebook page and RSVP to the event. Join the Marly’s Minions Facebook group to post progress pictures and find extra help. 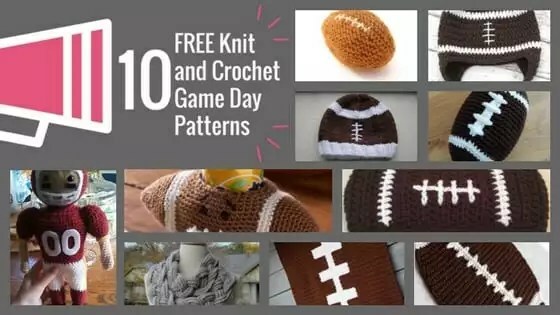 Favorite the Game Day Crochet 2019 project or Game Day Knitting 2019 project on Ravelry and log in your details so others can see. On Sunday, come back to this blog page every hour from 10am EST to 5pm EST to get the next “play” for your project. As you work on the project, post progress pictures on Facebook and Instagram with the tag #GameDayMakeAlong for a chance to win various surprise mystery prizes! Grand Prize details are below…keep reading. This is a Mystery Make-Along, so we can’t tell you too much just yet. What we can tell you is that it is a wearable and there is a knit version and a crochet version, so be sure that you are reading the correct clue! For the Game Day Mystery Make-Along 2019 project, you will need no more than 7 oz of worsted weight yarn all in same color (not sure how it would look in multiple colors so best to keep it to one colorway…yes variegated is okay). I’ve made samples in these yarns and the project worked up great. Favorite the Game Day Knitting 2019 on Ravelry! There are also GRAND PRIZE PACKAGES ! To have a chance to win, go to the Marly’s Minions group, add a picture of your finished project to the post labeled FINISHED PROJECTS, and sit back to see if you are the lucky winner of a prize package from Red Heart. How many GRAND PRIZES are there? That all depends on how many of you participate! We will give away one prize package for every 100 finished projects posted (one entry per person please). That means if 400 people post finished projects by 11:59pm EST, Feb. 4, 2019 we will give away 4 prize packages. The more people that participate…the more chances you have to win. Be sure to share the make-along with friends you think will love this. ‼️IMPORTANT‼️: All finished project photos must be submitted by 11:59pm EST on Monday February 4th. The winners will be randomly selected and announced on Tuesday February 5th. Open to USA and Canada. Be sure to come back every hour from 10am to 5pm on Sunday, February 3, 2019 to see the new play for that hour. Each hour the link to the play will be added to the time below. Simply CLICK the time you want. Make sure you post your finished project to the Marly’s Minions Group Post before the 11:59pm EST deadline on February 4, 2019 for a chance to win one of the Grand Prize Packages! The fun doesn’t stop once the game starts. Be sure to join us for a game of BINGO during the game. Just grab a card at the link below! You can start marking as soon as the game starts, and there will be an entry thread in the Marly’s Minions FB page for your finished cards. All you need is one regular, old-fashioned BINGO, so horizontal, vertical, or diagonal!